Halloween candy can be a kid’s dream and a parent’s nightmare. Family Dentist in Portland, OR Dr. Todd Beck at South Waterfront Dental encourage parents and kids to remember good dental habits during this candy-filled holiday. While it might be tempting to confiscate the majority of candy from your child’s stash after trick or treating, take this opportunity to teach moderation and good oral health skills this Halloween. 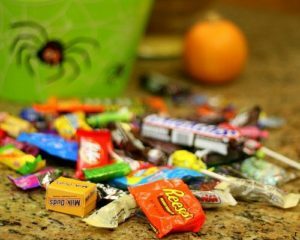 Not letting kids go trick or treating and eating some of their spoils can backfire by making the candy seem more desirable or even irresistible. It might also lead to your kids sneaking candy or feeling sick from overindulging. Instead, go through the pile of Halloween candy with your kids after trick or treating. Have them choose a group of their favorites – for example, their ten favorite treats – to allow them to eat. This will help send the message that candy and other sweets need to be managed because eating them excessively leads to cavities and other health issues. To keep kids from fixating on their pile of favorite Halloween candy, allow them to eat some of it after trick or treating. The rest of it can go in a special spot to be eaten at a certain time each day. This will help children practice moderation and stay balanced in their daily diets. It’s essential during this time to emphasize good dental health. Regardless of the limits you work out with the children and Halloween candy, it’s crucial to follow up eating candy with thorough brushing and flossing. This will wash away the plaque that forms on the surfaces and between teeth that lead to tooth decay. Plus, this will help stress the importance of keeping a healthy smile! After you’ve gone through this process with your kids, don’t forget to grab your own favorites from the Halloween candy stash and set them aside for your own enjoyment. Take the rest of the candy and put it in the freezer or donate it to classrooms or troops. Just don’t forget to brush and floss thoroughly for your own healthy smile! To make sure that your kids are on their way to healthy smiles for life, bring them in for a visit with dentist in Portland, Oregon Dr. Todd Beck or Dr. Jacob Morrow today – call 503-841-5658 to make an appointment!